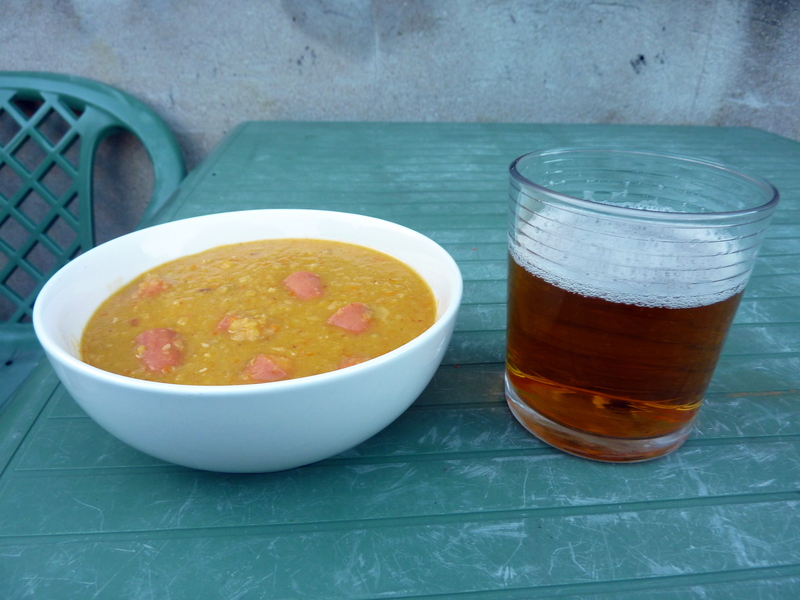 I have eaten many forms of this cheery soup; London Particular, German Split Pea Soup made with bacon or wurste, and most commonly in (for me) Amsterdam, where it is known simply as ‘snert’ and is almost everywhere during the winter months. In fact, it’s a cultural tradition that is almost everywhere in the northwestern corner of Europe in the winter months. This soup is usually made with ham stock and ham or smoked pork of some variety, but I’ve started to prefer to make a vegetarian version and then ring the changes throughout the week when having the soup for lunch. This also means I can give a bowl of soup to a greedy vegetarian. You can put sliced frankfurters in, a la Nigella Lawson (as I have here), or off cut chunks of ham,you could grill some bacon and serve it on top, some crumbled feta, or you could just sprinkle with paprika and olive oil. If you are not bothered about keeping this veggie, then I would make it with ham stock. Makes 4 generous bowls, very easily doubled. Cut the onion, celery and carrot into a fine as dice as possible, or blitz in a food processor until finely chopped. Warm a heavy based saucepan over a medium heat and put in your olive oil. When the pan is hot, put in the vegetables and cook them over a low heat until they have started to soften. If they start to fry or colour, the heat is too high. Add your bayleaf and mace, and then your peas and give everything a good stir. Pour in your stock, bring to the boil and then turn heat down, and gently simmer for an hour with the lid on. Keep checking throughout the process that the water hasn’t all been absorbed by the peas – you may want to top up with hot water from the kettle. Serve with desired accompaniments, as above. Another genius soup. Cheap (serves 4- 6 for about a quid in total), warming and naturally sweet, this is an easy to make low effort wonder. Lentils and carrots both cost almost nothing, and I had everything else in my cupboard. You’ll want a blender for this. If using cumin seeds, heat them in a dry frying pan with the chilli flakes for a few moments until they start to jump around or release their aroma. Remove around half of them to a large saucepan. In the same saucepan, put in the rest of the ingredients and bring to the boil, and then turn down to a simmer for about 30 minutes until the carrots and lentils are cooked. Leave to cool slightly and then either use a handblender in the pan or put the soup into a blender and whizz until (almost) smooth. 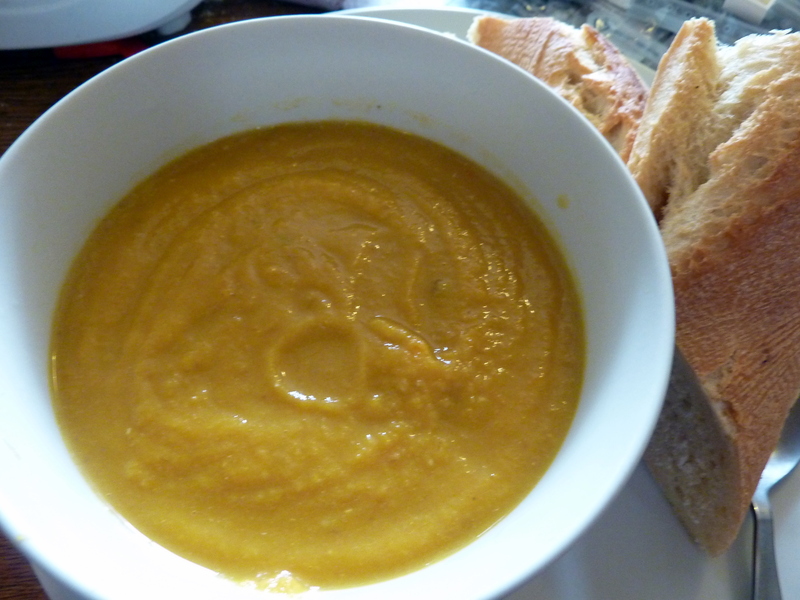 If the soup is too thick for your taste, add a couple of hundred ml of hot water from the kettle and blend again. Scatter over the remainder of the cumin seeds and chill flakes, heat through and serve. They say that chicken soup cures all that ails you. Obviously this isn’t accurate. Heartbreak, cancer and mother-in-laws still seem impervious to this wonder drug, but it is true that it can make you feel better about a lot of stuff. 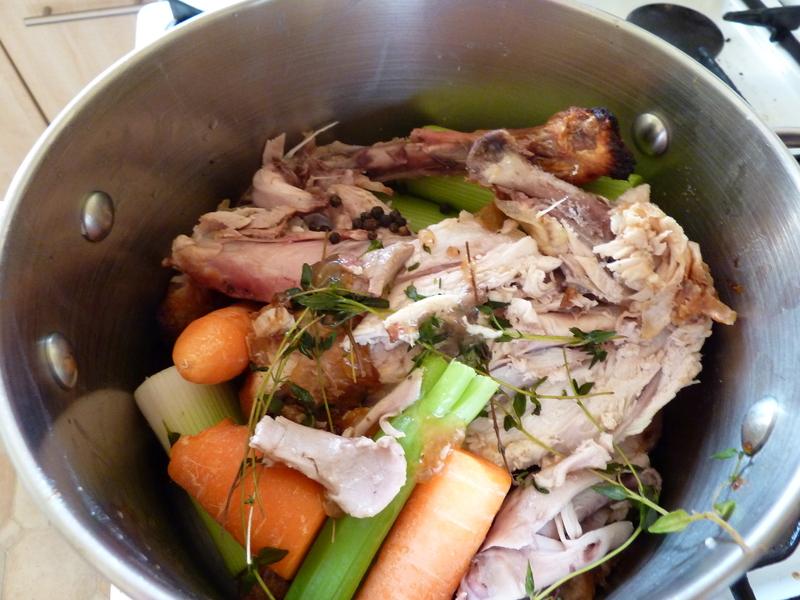 If you already have a cooked chicken carcass for whatever reason, then not only is it pennies to make, but a low effort way to stretch a roast chicken to an extra meal. I think this is fairly important, especially given the price of quality free range or organic chicken. I don’t often make my own stock, in all honesty. There is nothing particularly difficult about stock making, but having the time and the raw materials to hand at the same time is something a bit beyond me. You can get perfectly good stock these days in little bottles, so the incentive is not often there. But for this soup, there is no reason not to. This is not, though, a recipe for a perfectly clear amber stock, suitable for sauces and demi-glace, but rather a fairly lax way to get a tasty soup out of existing ingredients. You will only be cooking the stock for an hour or so, and I am not going to start suggesting skimming, or anything of that nature. There are other recipes out there for that. Put all the ingredients into a pot, and bring to a simmer slowly. Simmer for an hour, do not boil. Leave to cool, and then strain through a fine sieve. If using dried pasta or rice then heat the soup to a gentle boil and add these, allowing plenty of time for them to cook before adding the other ingredients. Gnocchi is good because it cooks in less than three minutes – about the same time as it takes to heat through cooked chicken, peas or sweetcorn. Add the remainder of ingredients for however long it takes to cook them usually. Alternatively, for a soup with a bit more body you can sweat off a chopped onion and a couple of cloves of garlic in a pan before adding veg like parsnips and potatoes and a dash of white wine before adding the stock. Up to you. Anything cooked should go in in the very last few minutes. There are many, many recipes for leek & potato soup out there. I typed ‘Leek and Potato Soup Recipe’ into Google and it came back with 254,000 results. 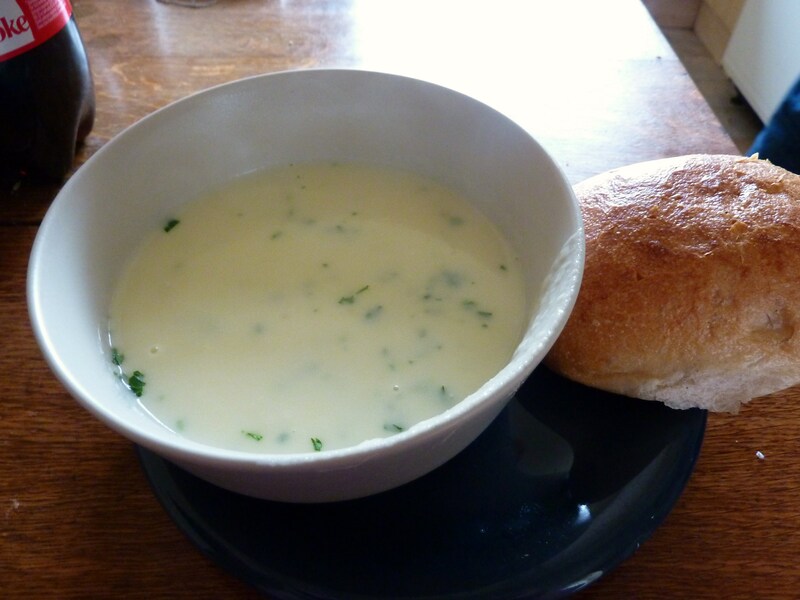 Leek and Potato soup is a miracle in many ways – it is very cheap, very easy and tastes absolutely amazing. In terms of bang for your buck, it is almost unbeatable. The version I decided to follow today is Joel Robuchon’s, because if you are going to make a french classic of anything, there is absolutely no reason not to use his recipe. I would say, however, if you are trying to cut back on calories, it will be perfectly fine to cut out the cream – it isn’t essential and cream’s omission will make it an extremely healthy dish. I also used parsley in place of the chervil, because I just couldn’t find any chervil today. Also, bear in mind that this is a blended soup – I used a hand blender in the saucepan. To serve 4, generously. Take your leeks and chop them into rounds approximately 2cm wide. Melt 20g of the butter into a large saucepan and add the chopped leeks. Cook, stirring in the melted butter for 3-5 minutes. You are aiming for the leeks to become slightly translucent but not browned. Add the cold water and bring to a simmer, add your salt and simmer for a further ten minutes. In the meantime, peel and chop your potatoes and add them to the water. Bring back up to simmering point and cook for 30 minutes with the lid partially on the saucepan. Take the pan off the heat, and when it has slightly cooled either whizz in the pan with a hand blender or pour the soup into a blender and blend until smooth and creamy. Return to the saucepan and return to simmering point again. Now turn the heat off for a final time and stir in the cream and remaining 5g of butter. Sprinkle with herbs and serve.